Students and their families played great games and participated in fun activities at the first PTA Family Game Night December 2, 2016 at Perkins Elementary School! Everything from “Perfection” and “Rock'em Sock'em” to“Yetti in My Spaghetti,” “Legos,” “Connect 4“and “Operation,” there were lots of options to choose from as kids and families sat down, relaxed and played games together. 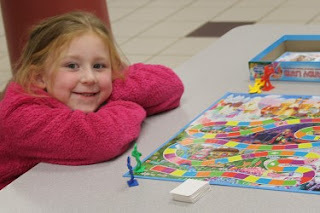 As part of the family-engagement efforts by the Perkins PTA, the Game Night was geared toward giving students yet another opportunity to have an enjoyable time in the evening at school with their parents, grandparents and siblings. Not only were there games, but students could make holiday crafts, watch a short Christmas movie, vote on the upcoming cover design of the Perkins School yearbook, eat candy canes and enter into the raffle for free prizes. In the end, 18 students won a brand new game, provided by the PTA, to take home and enjoy for the holiday season – the perfect ending to a fun-filled night! 0 Comments to "Game Night Held at Perkins School"